You can follow the beaten path and call yourself an entrepreneur or you can blaze your own trail and really be one. When Derek Sivers started CD Baby, he wasn’t planning on building a major business. He was a successful independent musician who just wanted to sell his CDs online. When no one would help him do it, he set out on his own and built an online store from scratch. He started in 1998 by helping his friends sell their CDs. In 2000, he hired his first employee. Eight years later, he sold CD Baby for $22 million. Sivers didn’t need a business plan, and neither do you. You don’t need to think big; in fact, it’s better if you don’t. Start with what you have, care about your customers more than yourself, and run your business like you don’t need the money. "If you want a true manifesto, a guidebook with clear signposts, and a fun ride you'll return to again and again, you have it here in this book. I hope you enjoy it as much as I did." "[I] burned through the book in about an hour. Wow. Really. Derek shares some of the principles (and anti-principles) he learned and applied during his time as an accidental entrepreneur and how to grow a business without losing your soul." 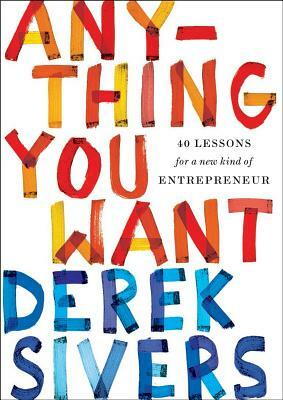 "One of the best hours you’ll ever spend will be reading Derek Sivers’s new book…Anything You Want."